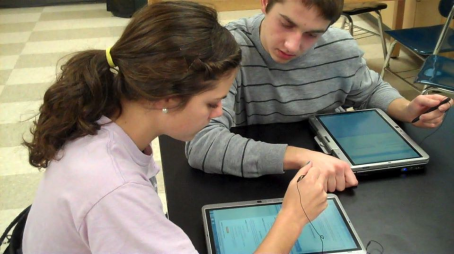 Technology can be a helpful tool for evidence-based teaching – but only if used effectively. Advances in technology and social media have progressed rapidly and drastically in the last few decades. Technology can enhance our teaching and support our students’ learning, but it has to be used properly for it to be effective. Millions of pounds have been spent on technology for learning, but the evidence suggests that this investment hasn’t always been effective. What is an ineffective use of technology? When technology is used ineffectively, it has no positive effect on learning, and can waste time and distract from learning. Here are a few examples of ineffective uses of technology. The teacher believes that simply having the technology can improve learning. Students aren’t supervised enough and so end up off task. The teacher wastes lesson time trying to get the technology working. The use of technology replaces an alternative activity that would have been more effective. The teacher doesn’t have enough training in the use of technology or isn’t confident using the technology. What is an effective use of technology? to implement and evidence-based method, for example mind-mapping software, or displaying graphics or animations. by a teacher who has been trained both in the technical side and the pedagogical (learning) value of the technology. for short, focused sessions, rather than for the whole course. in catch-up sessions for lower-achieving or disadvantaged students. to free the teacher up to spend more time helping students. in a way that helps the students to work harder at the task. collaboratively in small groups or pairs of students. Technology in the classroom works best if it is integrated into the learning and the lesson. It should be planned and have a purpose, and ideally be essential to the activity rather than a random add-on. It should be used routinely, and should support teaching and learning. It can be a helpful tool to engage students, especially when it encourages higher-order thinking skills. It should be used mostly by the student and should be easy to get into without much instruction. 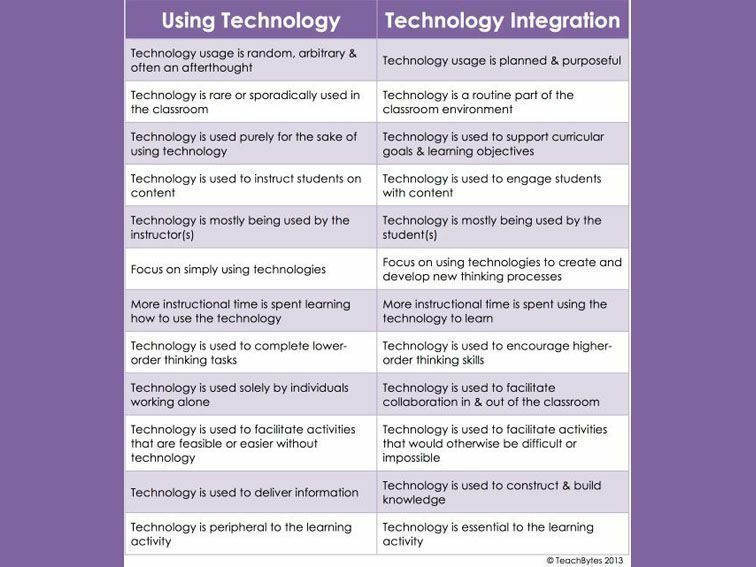 Here is a table from TeachThought which compares the use of technology with the integration of technology.